I rarely write about Pudong in this blog, as I focus on a time when Pudong was mostly warehouses and rice fields. Working in financial consulting, I often go to Lu Jia Zui financial district. During a recent meeting, I took the below picture through the office window, probably one of the best view of the French Bund. Concessions were first opened for trade, and access to the River was of prime importance. 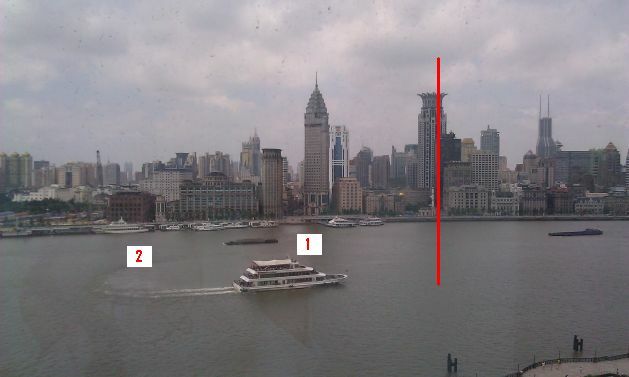 British arriving first, they took the best spot, the mouth of the Huangpu River and the Suzhou Creek. 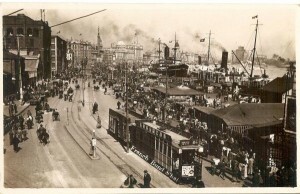 Americans arriving second took what is now called the North Bund, on the other side of the Suzhou Creek. The British and American concessions were later merged to become the International Settlement. French arriving last, they could only take a small part between the British Settlement and the Chinese city (see map below). As written in a past post, the border between both concession was the Yang Jing Bang river, that was later transformed into today’s Yannan lu. 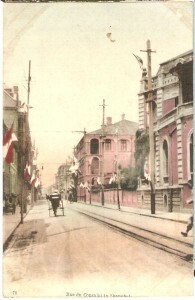 Yannan lu reaches the Bund at the above red line, with the Guslav tower on the Bund being inside the French Concession. Buildings on the French Bund have been less preserved than on the British Bund, but there are still interesting pieces. #1 is the entrance to the “Rue du Consulat”, today JingLing lu. The street was the main spot of the early French Concession, much earlier than later Avenue Joffre (today Huai Hai lu). Just like the British Consulate, the French Consulate was located on the Bund, at the corner of the Rue du Consulat and the French Bund. Picture left is a late 19th century view of Rue du Consulat, with a French Consulate building on the right side. The building was destroyed in the 1980’s to create a ugly building that has since been replaced by an art deco tower. On the right side, is located the former headquarters of the “Messageries Maritimes“. The streamline building by Swiss firm Minutti was built in the mid thirties, showing to the World the importance of the French Lines. On the left side, there is now a fake beaux-arts style tower occupied by the Shanghai branch of Taipei’s boutique hotel Les Suites. The building behind is an old office building that was occupied during the 1930’s by the “Journal de Shanghai”, the French paper published in the city. Further on the street is located Saint-Josef Church, the original French cathedral (built years before Xu Jia Hui St Ignacius Cathedral), as well as the Hotel des Colonies. Further down is the office building that hosted night club Attica a few years ago. This shows the line of Avenue Joffre (Huai Hai Lu), marked by the golden tower visible above.